Don't buy hats for your next party. Let the kids make their own party hats. You will be surprised by the amazing results using the ideas in this craft activity. 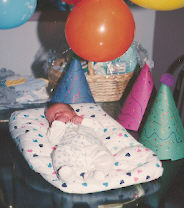 When my son was born, we planned a birth party for him. Actually the party was an activity to keep my older daughter happy and busy. At the last minute she realized we didn't have hats for the party. We made simple cone hats and decorated them. My son is now two, and she still thinks these are the best party hats we've ever had. Use the 12" side as the height and the 18" to go around the head. To make the cone shape, draw a wide triangle, then change the bottom from a straight line to a curved shape. You may want to experiment using newspaper to get the shape right. Use whatever craft material you have on hand for the children to decorate the party hats. While the party hats are drying, put a line of white glue down one side of the triangle. Then rolled it into a cone shape. Use a paper clip on the top and bottom to hold it together until the glue dries. This party hat may not last as long, but is much easier to fit. Draw a triangle in the center of the page, with a rectangle that runs the length of the paper at the bottom. 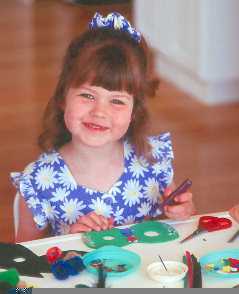 Have the child decorate one side with craft materials, and let dry. To fit the party hat to the child's head, use the rectangle as a headband. Measure for size, then tape, glue or staple the hat. The triangle is the front of the hat, with the band running around the child's head. If you aren't using colored paper, paint or spray paint the paper first. Use glitter glue to draw designs on the paper. Glue on yarn, ribbon, pom poms, fancy buttons, sequins, or whatever you have on hand. Use markers or crayons to draw designs on the party hats. Cut out shapes from the left over paper and glue on. 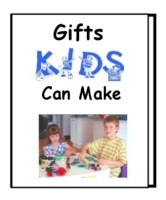 Let the kids come up with more craft ideas. These hats are larger than the traditional birthday hats that need elastic to stay on. You can add ribbon or string to tie the party hats on if the kids want ties on their hats. Use at least two sheets of large newsprint at least 3' on each side. Place the sheets at different angles (should look like an 8 point star). Center it over the person's head, and hold scrunch it down to make a head shaped dome in the center. Wind masking tape around the bottom of the dome (app. ear level). Scrunch and roll the sides in to finish the sombrero shape. Decorate the sombreros using what ever materials you have on hand. Paint or spray paint the paper before it is made, or after the hat is shaped. Make a ribbon or paper band to cover the masking tape. Make a fringe out of paper, fabric, or ribbon to go around the bring. Use markers or crayons to draw designs on the hats. Make it into an Easter Bonnet by gluing on some silk flowers from an old arrangement or 2nd hand store. Let the kids come up with more ideas. Follow the idea for Sombrero Hats but create different shapes. Push a bit more paper up in the center before winding the masking tape. Use scissors to cut the brim to create a Top Hat shape. Similar to a Top Hat, you could make a Stetson Hat. After cutting the brim, use gently pressure to create the crease in the center of the top. Use glue or tape to bring up the sides of the brim. If you don't want to paint your party hat, use colored tissue paper to create your hat. Here's a tip from on of our visitors. "We had a great time making the paper hats. We made a cowboy hat for the boys and English Ladies hats for the girls and used ribbons and paper flowers to decorate them. Also, coated the final hat with a thin layer of white glue mixed with water - it makes the hat a little more durable and gives it a slightly shiny finish." Kay L.
Send in your ideas for different variations. Let us know if your kids have fun making their own party hats using the ideas in this activity. Send us a note if you have any questions.